Four suspects sentenced to death for the January 2008 assassination of a US diplomat and his driver in the Sudan are depicted escaping from a maximum security prison during the summer of 2010. The newly produced video was disseminated by a jihadist media group calling itself “al-Hijratain Foundation.” Image courtesy of the SITE Intelligence Group. A jihadist media group calling itself the “al-Hijratain Foundation,” a possibly al Qaeda-affiliated group tied to the murky Sudanese terrorist front known as Ansar al-Tawhid (Partisans of Monotheism), has released a video detailing the June 2010 prison escape of the four men sentenced to death for the 2008 assassination of an American diplomat and his driver. On Jan. 1, 2008, John Michael Granville, an American USAID worker and his Sudanese driver, Abdel Rahman Abbas, were shot at least 17 times after leaving a New Year’s Eve party held at the British Embassy in Khartoum, according to the New York Times. Not long after, Sudanese authorities detained five men believed to have committed the assassination: Mohamed Makkawi, Abdel-Basit Haj al-Hassan, Mohannad Osman Youssef, Abdul Raouf Abu Zeid Muhammad Hamza, and Murad Abdel-Rahman Abdullah. Two of the men were arrested in February 2008 by Sudanese authorities after a brief shootout in a suburb of Khartoum’s twin city, Omdurman. In 2009, a Sudanese court sentenced all of the suspects to death except Abdullah, who was sentenced to two years in prison. In June 2010, however, the four men who had been sentenced to death managed to escape from the heavily fortified maximum-security Kober federal prison. Sudanese officials reported in September 2010 that the fugitives were likely hiding in Darfur. The 41-minute, 29-second video, titled “Breaking the Shackles, Part One,” was distributed by the al-Hijratain Foundation on jihadist forums on Dec. 27, 2012, according to the SITE Intelligence Group, which obtained and translated the video. 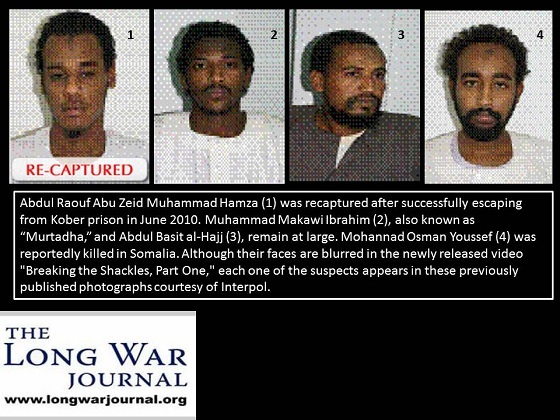 All four members of the formerly imprisoned Ansar al Tawhid cadre appear in the video, although it has been widely acknowledged that Mohannad Osman Youssef was later killed fighting in Somalia, and that Abdul Raouf Abu Zeid Muhammad Hamza was recaptured within three weeks of his escape from prison. The video meticulously depicts how the four prisoners dug what they claimed was a 125-foot tunnel under the Kober prison grounds. It also shows that the group had stolen a set of keys from an inattentive prison guard, which they used to unlock their leg irons so as to be able to work on the tunnel unimpeded, according to the Sudan Tribune‘s analysis of a copy of the video shown on YouTube. The video apparently contains footage of the inmates working on the tunnel while they were incarcerated, which raises serious questions about how closely the prisoners were being monitored in what many have described as Sudan’s most advanced maximum security prison. Several Salafist insurgent organizations are known to operate in the Sudan, including al Qaeda in the Land with Two Niles, and Ansar al Tawhid (Partisans of Monotheism). There is also a large and vocal Salafist organization in Sudan, Ansar al Sunnah, although the fundamentalist group has repeatedly denied accusations that it facilitated sectarian attacks against Sudan’s traditionally moderate Sufi Muslims. One of the escaped convicts shown in the video, Abdul Raouf Abu Zeid Muhammad Hamza (who has since been recaptured), is the son of a prominent leader of Ansar al Sunnah, Abu Zaid Mohamed Hamzah. Sudanese authorities have clashed recently with a network of suspected Salafist insurgents, although officials were not inclined to name the organization with which the militants were affiliated. Fierce battles in early December between Sudanese authorities and militants holed up in the Al-Dinndir Wild Life Park in Sennar state reportedly killed three suspected Salafist insurgents and led to the capture of 25 others, according to the Sudan Tribune. Sudanese security officials believed the group was planning to assassinate local officials and target Western diplomatic missions in the country.